The longlist for the Polari First Book Prize was announced tonight (June 6) at the Polari Literary Salon in London’s Southbank Centre. Now in its seventh year, the Prize is awarded annually to a writer whose first book explores the LGBT experience, whether in poetry, prose, fiction or non-fiction. The twelve-strong longlist brings together an exceptional collection of drama, poetry, memoir and fiction. From Kuwaiti-born Haddad’s depiction of gay life in a post-Arab Spring dictatorship, to Matthew Todd’s ground-breaking investigation of contemporary gay culture; a pacey female gang thriller by barrister-turned-author Jules Grant, to Chitra Ramaswamy’s pregnancy memoir, a fresh perspective on the most extraordinary and ordinary of experiences. Chair of judges Paul Burston, said: “This is a really strong, diverse long list. From novels and short stories to memoir, monologues, poetry and political calls to arms, it demonstrates the wealth of literary talent our community continues to produce and reflects the many challenges LGBT people still face in today’s society. The shortlist of up to 6 titles will be announced on Monday July 31, 2017 at a special Polari Literary Salon hosted at the Southbank Centre. This will coincide with a bumper series of events organised by the multi award-winning salon, as it celebrates 10 years of championing LGBT voices in literature, with the largest ever LGBT literary tour undertaken in the UK, funded by Arts Council England. The 16-date tour will start at Bradford Literature Festival on July 7 and will move on to a special event at Hull Pride/City of Culture on July 27 marking the anniversary of The Sexual Offences Act 1967. Set over the course of 24 hours, Guapa follows Rasa, a gay man living in an unnamed Arab country trying to carve out a life for himself in the midst of political and religious upheaval. Saleem Haddad was born in Kuwait City to a Lebanese-Palestinian father and an Iraqi-German mother, and was educated in Jordan, Canada and the United Kingdom. He has worked as an aid worker in Yemen, Syria, Libya, Lebanon and Iraq. His writing has appeared in Slate, the Los Angeles Review of Books and The Daily Beast, among other publications. He currently lives in London. When Chitra Ramaswamy discovered she was pregnant, she longed for a book that went above and beyond a manual; a book that did more than describe what was happening in her growing body. Expecting is a book of intimate, strange, wild and lyrical essays that pay tribute to this most extraordinary and ordinary of experiences. Chitra Ramaswamy is an award-winning journalist, regularly contributing to a number of publications including the Guardian. She often chairs events at festivals and regularly reviews on radio. At fifty, Michael thought his life was over. In his mid-thirties, David wanted his life to begin. After these fathers divorce, they meet at a support group and fall in love. Their romance forces them to fight for the love of their children and battle against bigots who refuse to understand their lives as Italian and Black British fathers. Martin Patrick has written five plays and has a PhD in Film, Drama, Race and Gender in Cultural Studies. He was Senior Lecturer in Drama and Film Studies and now teaches aspiring LGBT, Black and Asian authors at GreatNewWriters.com. He lives in London. A refreshing depiction of women in crime fiction, this thrillingly novel follows lesbian gangster Donna who runs an all-female gang in Manchester. Unlike the city’s male gangs, caught up in violent turf wars, the women keep their heads down, selling drugs in perfume atomisers in club toilets. That’s until Donna’s best friend Carla is gunned down… Jules Grant is from Manchester. She has an MA in Creative Writing from Birkbeck College, University of London. She worked as a barrister for over twenty years. Part memoir, part ground-breaking polemic, Straight Jacket explores contemporary gay culture and asks if gay people are as happy as they could be. In an attempt to find the answers to this and other difficult questions, Todd explores why statistics show a disproportionate number of gay people suffer from mental health problems, and why significant numbers experience difficulty in sustaining meaningful relationships. Matthew Todd is editor-at-large at Attitude magazine and author of Blowing Whistles, a play performed in London, Manchester, Sydney, Melbourne and in the United States. He lives in London. Thirteen eclectic works of dark fiction, taking the reader from Los Angeles to the eastern townships of Quebec. Ortega-Medina’s characters are flawed, broken individuals, trying their best to make sense of their lives as they struggle with sexuality, death, obsession, and religion. Orlando Ortega-Medina is a US born British-Canadian author of Judeo-Spanish descent. He studied English Literature at UCLA and has a Juris Doctor law degree from Southwestern University School of Law. He resides in London, where he practices US immigration law. The Chemsex Monologues explore the sexual, high world of the chillouts through six different characters. Explicit, funny and touching, it displays a realm that is sometimes dark, but populated by very real, loveable human beings. Patrick Cash writes for the theatre and is a contributing editor to Attitude and Vice. He was named ‘One to Watch’ on the Independent on Sunday’s Rainbow List as a playwright. A collection of poetry and prose exploring connection and disconnection with places and people. From Washington D.C. to Accra and Paris, Letters I Never Sent to You tells Varjack’s story- a life split between places, identities, languages, nationalities and sexualities. Paula Varjack is a writer, filmmaker and theatre maker. Her work explores identity, the unsaid, and making the invisible visible. She has performed at numerous arts festivals and cultural spaces including Glastonbury Festival, Berlin International Literature Festival, Tate Modern and the V&A. She is the creator of the Anti-Slam a satirical take on Poetry Slams where the lowest score wins. Born in Washington D.C. to a Ghanaian mother and a British father, out of the many places she has lived she considers east London to be “home”. Twenty-one year old Violet has fallen out of love with life. A dissolute figure, she wakes up one day after a three day drug and alcohol binge and decides to steal her friend’s baby, seeing in the child a chance of a new future and a hope for salvation… Laura grew up in the suburbs of London and spent seven years teaching skiing, snowboarding and English around the world. Now living in Sheffield, She teaches Creative Writing at Sheffield Hallam University and for the Workers’ Educational Association. Rufius is set amongst the sights, disputes and social structures of 4th Century Alexandria. A society once renowned for its tolerance, dissent and learning, it follows the lives of three interlinked characters in the lead up to the inter-faith massacres and wholesale destruction of the city’s famous library. Sarah Walton lives in Lewes, delivers digital strategies to businesses, and finds inspiration from buried treasures in the British Library. She has a PhD in Creative Writing. Threads is a collaboration of poetry and bespoke photography from Nathan Evans and Justin David. Written over a twenty year period, the poems are threaded through with themes of sexuality, mortality, love and nature. Nathan Evans is an author and playwright and has performed at venues and festivals including Roundhouse, Komedia, Glastonbury and Bestival. He has a degree in Fine Art from Oxford University. A witty and heart-warming coming-of-age tale set in the 1990s. It follows adolescent Crissy who lives with her temperamental mother, jobless father and sister Veronica in Cardiff. Crystal Jeans was born and brought up in Cardiff. She lived in Bristol before doing first a Creative Writing BA then an MPhil at the University of Glamorgan. She works in a care home, which inspired Just Like That, a collection of poetry about dementia (Mulfran Press). The Polari First Book Prize was launched in 2011 and previous winners include Paul McVeigh, Kirsty Logan, Diriye Osman, James Maker and Mari Hannah. Coinciding with the 10th year anniversary Polari Salon tour, the shortlist will be announced Monday July 31 at Southbank Centre. The winner will then be announced at the London Literature Festival in October at the Southbank Centre. 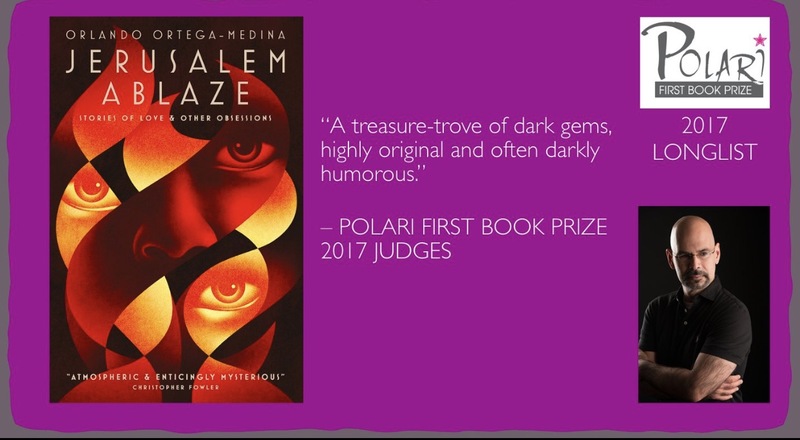 Polari First Book Prize partners with WH Smiths Travel and last year’s shortlisted books were displayed in Travel outlets nationwide.